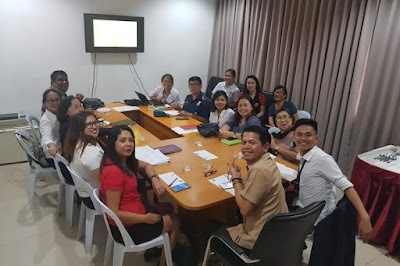 BUTUAN CITY, Nov. 12 (PIA) – The Gender and Development (GAD) advocates in Caraga region led by the Regional GAD Committee (RGADC) have lined-up activities for this year’s celebration of the 18-Day Campaign to end violence against women (VAW) from November 25-December 12. The members of the RGADC agreed that the said campaign will kick-off on November 26 (Monday) since November 25 falls on a Sunday. It will start with the conduct of an ‘Advocacy Walk’ from the Agusan del Norte Provincial Capitol going to Guingona Park, this city. The opening program will then follow highlighting the ‘Kikay Kit Bonanza’ where VAW survivors will be given hypoallergenic cosmetic items. Right after the program, all participants will also be joining in the ‘Color Me Zumba’ at the same venue. On the same day, the Philippine Information Agency (PIA) Caraga will be facilitating the press conference, where media partners in the region will be updated on pressing gender issues in the region, VAW cases, and other GAD-related concerns. On December 3, the RGADC has a joint activity with the Regional Inter-Agency Committee Against Trafficking – Violence Against Women and Children (RIACAT-VAWC) Caraga dubbed “Panagtagbo” or gathering of VAW survivors in the region, which will be held in Surigao City. Here, RIACAT-VAWC will be giving out Noche Buena package to some 50 VAW survivors. A Community-Based Dialogue will also be conducted on December 5, 2018. It is a referral system of VAW cases with personnel from the Philippine National Police (PNP), Department of Social Welfare and Development (DSWD), Public Attorney’s Office (PAO), local government units, barangay officials, and VAW survivors. In time also with the 70th anniversary of the Universal Declaration of Human Rights (UDHR) on December 10, the RGADC chaired by the Commission on Human Rights (CHR) will be spearheading a program, along with the ‘Anniversary Walk and Candle Lighting, Anniversary Dinner and Film Showing. Meanwhile, as part of the culminating activity for the 18-Day Campaign to end VAW, the VAW Desk Officers will convene on December 11-12 for the RIACAT-VAWC’s Women’s Summit. SAN FRANCISCO, Agusan del Sur, Nov. 12 - The consumers and business sector in the province actively participated in the recently-concluded Consumer-Business (ConBiz) Forum held at the Mabe's Savory Place here. The forum covered topics on Effects of Tax Reform on Acceleration and Inclusion Act, presented by Rose Calo of the Bureau of Internal Revenue (BIR) Bayugan City, Tips on On-Line Shopping and E-Presyo by Lorijane Sacote and Nunila Estareja of the Department of Trade and Industry (DTI)-Caraga Regional Office, Status and price trending of rice and other agricultural products by Josefa Gidacan and Clarence Malbasias of the Department of Agriculture (DA)-Caraga, and Status of National Food Authority (NFA) rice and other grains in the province by Dennis Padura of the NFA-Agusan del Sur. BISLIG CITY, Surigao del Sur, Nov. 12 (PIA) – Three New People’s Army (NPA) terrorists surrendered to the military in Surigao del Sur recently. The surrenderees were identified as Richard Rojas a.k.a. Adan (45 years old), a resident of Bunawan, Agusan Sur; Mario Silades a.k.a. Telik (41 yrs old); and Jimmy Juyamag a.k.a. Camote (35 yrs old) both residing in Barangay Doña Carmen, Tagbina town. Capt. Edwin Leo Francisco, Civil Military Operations Officer of the 75th Infantry Battalion (75IB), said the NPA fighters coming from the Guerilla Front 14, turned themselves in at the headquarters of the Army’s 75th Infantry Battalion in Bislig City. They also surrendered high-powered firearms and improvised explosive device (IED) such as one M653 with one steel long magazine loaded with ammunition, one cal. 30 US Carbine M2; one homemade cal. 9mm Ingram; and one CAP4 anti-personnel mines. Capt. Francisco added that the three surrenderees will undergo the proper validation and assessment process for them to avail the Enhanced Comprehensive Local Integration Program (E-CLIP) of the national government. Through the said ordinance, authored by Sangguniang Bayan Member Victor A. Cain, the local government of the municipality of Magallanes will give gratuity pay to the qualified retiree as government officials and employees who rendered exemplary services during their employment in the local government. The gratuity pay is as follows: For those employees/retirees who rendered 30 years in service and above will receive Php15,000.00; Those retirees who incurred 20 years to 29 years in service will also receive Php12,000.00; Those retirees who served 15 years to 19 years in service will receive Php10,000.00; Retirees who rendered 14 years and below shall be through pro-rated computation based upon service record and to be determined together with the fiscal officers and the SB Committee on Finance, Budget and Appropriations. For those municipal officials who have finished three consecutive terms of office (9 years) will also receive a gratuity pay in the amount of Php10,000. 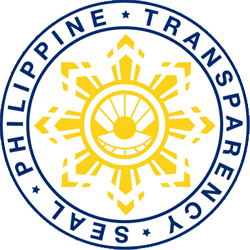 The measure aims to promote the good attributes of public officers and employees and serve as motivation to every official and employee to render exemplary service to its office and constituents during their term of employment as mandated in Republic Act 6713, Code of Ethical Standards of Government officials and Employees. BUTUAN CITY, Nov. 12 - Contestants from the province of Agusan del Norte dominated this year's Consumer Quiz Bowl. Rodrigo J. Arriba, Jr. of Carmen National High School who earlier topped the Agusan del Norte Division-Level Quiz, was hailed Regional 1st place winner. This is a back-to-back win of Arriba and his coach Mindalita S. Sodicta having gotten the top spot in last year's contest, as well. Meanwhile, Jeanalyn T. Tiempo of Calamba National High School from the Cabadbaran City Division got 3rd place. She was coached by Jehainie S. Ponce. As top three winners both Arriba and Tiempo received medals, certificates, tokens and cash prices of Php 5,000.00 and Php 3,000.00, respectively. Butuan City Division Quiz winner Nicell Mae G. Socorro of Butuan City School of Arts and Trades also joined the regional tilt and placed 7th out of 12 contestants. She was coached by Myra H. Trazares. The division level quiz bowls were held last October 12 (Butuan City Division), October 16 (Cabadbaran City Division), and October 17 (Agusan del Norte Division). The regional contest, on the other hand, was done October 30 at the Atrium of Robinsons Place Butuan. SURIGAO CITY, Surigao del Norte, Nov. 12 (PIA) – There are now 10 Negosyo Centers across the province of Surigao del Norte where micro, small and medium enterprises (MSMEs) can visit to avail business development programs and services. The Department of Trade and Industry (DTI) recently launched its 10th Negosyo Center (NC) in Surigao del Norte in the Municipality of Placer on October 29, 2018. This is also the 39th Negosyo Center in the region. The establishment of the Negosyo Centers was aimed to promote ease of doing business and facilitating access to services for MSMEs. Negosyo Centers are currently present in Surigao City, Bacuag, Claver, Dapa, Del Carmen, Mainit, Placer, San Francisco and Socorro. In her message during the Negosyo Center launching, DTI Caraga Assistant Regional Director Gay A. Tidalgo urged the MSMEs present to take advantage of the services of the negosyo centers especially in the areas of access to finance, market access and product development. Further, she said that DTI services are now more accessible because of the presence of the NCs in the municipalities. Placer Vice-Mayor Reynaldo R. Seeto thanked the DTI Surigao del Norte for setting up a Negosyo Center in the municipality as he believes it will boost Placer’s local economy. Philippine Chamber of Commerce and Industry Regional Governor and Provincial Micro, Small and Medium Enterprises Development Council Chair Concepcion R. Paqueo also encouraged the micro enterprises present during the launching to constantly produce their products because the chamber will help them in the market access. Republic Act 10644 or the Go Negosyo Act mandates the creation of Negosyo Centers in every municipality, city and province throughout the country to help grow the micro, small and medium enterprise (MSME) sector which accounts for around 99 percent of registered businesses in the Philippines. SAN MIGUEL, Surigao del Sur, Nobyembre 12 (PIA) – Mahigit sa 250 lumad ang nakiisa at nakilahok sa ginanap na peace caravan at diyalogo na binansagan sa lokal na lingwahe na “Panaghiusa sa Kalinaw, Ipatigbabaw” (Pagkakaisa para sa Kapayapaan, Pagtibayin) na ginanap sa School of Living Tradition (SLT), Sitio Nalindog, Baranggay ng Bolhoon, San Miguel kamakailan. Ayon kay Captain Francisco Garello Jr., ang Civil Military Operation Officer ng 36 Infantry Battalion, nakinabang din ang mga residenteng lumad na dumalo sa nasabing okasyon sa libreng pangunahing serbisyong pampubliko na hatid ng iba’t ibang ahensya ng gobyerno na nakilahok sa naganap na aktibidad sa pangunguna ng lokal na pamamahalaan ng bayan ng San Miguel sa pamamagitan ng Local Crisis Management Committee. Dagdag pa ni Garello, iilan sa mga serbisyong dala ng iba’t ibang ahensya ay ang libreng konsultasyon Pangkalusugan o Medikal at Dental at libreng gupit ng buhok. Namahagi rin ng mga ito nang “food packs” at mga butil ng mga gulay (seedlings) para sa mga residente doon. Sa ginanap na diyalogo sa nasabing lugar, sinabi ni Garello na hiniling ng mga residenteng lumad na masolusyonan ang mga isyung kinakaharap ng kanilang tribu sa kasalukuyan. Iilan sa mga isyung natalakay ay ang pagpatay ng mga lumad na hiniling umano ang agarang tulong ng gobyerno na masolusyonan ito. Nabanggit din umano ang isyu tungkol sa kanilang karapatan sa “Ancestral Domain”, isyu sa edukasyon, at ang usapin patungkol sa IPRA law. Hayagan naman na ipinaliwanang ng representante mula sa National Commission on Indigenous People (NCIP) sa probinsya sa katauhan ni Robert Bat-ao ang kanilang mga karapatan. Dumalo din ang mga lider ng lumad sa pangunguna ni Datu Rico Maca, ang Indigenous People Mandatory Representative (IPMR) ng nasabing bayan na nagbibigay ng kanyang mensahe para magbigay daan na maiintindihan ng mga residente ang mga kasagutan sa bawat isyung inilalahad sa ginanap na diyalogo. TANDAG CITY, Surigao del Sur, Nobyembre 12 (PIA) – Pinaghahandaan na ng National Food Authority (NFA) sa Surigao del Sur ang pagpapatupad ng suggested retail price (SRP) para sa bigas sa Surigao del Sur. Sa panayam ng Radyo Pilipinas kay NFA Provincial Manager May Sarah Atomar Sabarre, inihayag nito na ang pagpapatupad ng SRP sa bigas ay magsisimula sa Nobyembre 9, 2018 sa buong probinsya. Kasabay nito, ipapatupad din ang labeling sa bigas at paglalagay ng tamang presyo nito. Napag-alaman na ang labeling ayon sa inaprubahan na alituntunin ng NFA Council kamakailan ay ang mga sumusunod: Regular Milled Rice-(lokal) – P39/kilo; Well-Milled Rice (lokal) – P44/kilo; Premium Rice (local) - P47/kilo; Well-Milled Rice (imported)- P39/kilo; at Premium Rice (imported)- P43/kilo. Samantala wala namang itinalaga na presyo para sa Special Rice. Inihayag ni Atomar na ang opisina ng NFA ang mamumuno sa pagpapatupad ng SRP at labeling ng bigas na magsisimula na sa Biyernes. 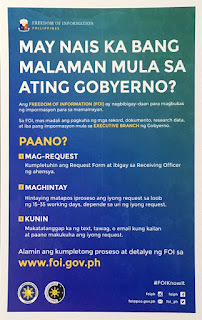 Kaagapay nito ang Department of Trade and Industry (DTI) at Philippine National Police (PNP), dagdag pa niya. Itinakda na rin ang pagpupulong na gaganapin sa mga nabanggit na ahensya na tutulong sa pagpapatupad ng SRP at mga retailers ng bigas sa boung probinsya kung saan tatalakayin nito ang mga parusa sa mga lalabag sa nasabing kautusan. LUNGSOD NG BISLIG, Surigao del Sur, Nobyembre 12 (PIA) -- Tatlong aktibong myembro ng Guerilla Front 14 New People’s Army (NPA) ang boluntaryong sumuko sa gobyerno noong araw ng Sabado, Nobyembre 3, 2018 sa Barangay Doña Carmen, Tagbina, Surigao del Sur ayon sa opisyal ng militar. Napag-alaman mula kay Captain Edwin Leo Francisco, 75th Infantry Battalion (75IB) Civil Military Operations Officer, na mapayapang sumuko ang tatlong teroristang NPA sa pakikipagtulungan na rin ng Community Support Team (CST) at Intelligence Operatives ng Alfa Company ng 75IB dala ang kanilang mga armas. Sa pinadalang ulat, kinilala ang mga sumuko na sina: Richard Rojas alyas “Adan” (45 taong gulang), residente ng Bunawan, Agusan del Sur; Mario Silades alyas “Telik” (41 taong gulang); at si Jimmy Juyamag alyas “Camote” (35 taong gulang) parehong naninirahan sa Barangay Doña Carmen, Tagbina. Kasabay din na isinuko ang kani-kanilang mga armas na dala sa araw ng kanilang pagbalik-loob sa 75IB na pinamumunuan ni Lt. Col. Jaime Datuin ang isang M653 at magazine na may bala; isang cal. 30 US Carbine M2; isang homemade cal. 9mm Ingram; at isang (1) CAP4 Anti-Personnel mines o improvised explosive device (IED).